Frequent online shoppers might be tempted to download and install Popcornew due to the misleading marketing strategies employed by the publishers of this application. Popcornew should display discount deals, special offers, and coupons, thereby helping you save money and time while you are shopping online. In reality, this service is presented very poorly and all the displayed ads are virtually worthless and will only disturb your web surfing experience. Popcornew is just your average adware application that will most consume much of your time, as you will have to fight through numerous ads and pop-ups while browsing the web. Removal of Popcornew is essential, as that is the only way to restore the normal functionality of your browser. Do not hesitate to use the removal guide provided below to get rid of Popcornew immediately. The research has shown that Popcornew is closely related to Boxore Adware, so it is not surprising that the two have certain similarities in the way they function. Like its counterparts, Popcornew will affect Google Chrome, Internet Explorer, and Mozilla Firefox. 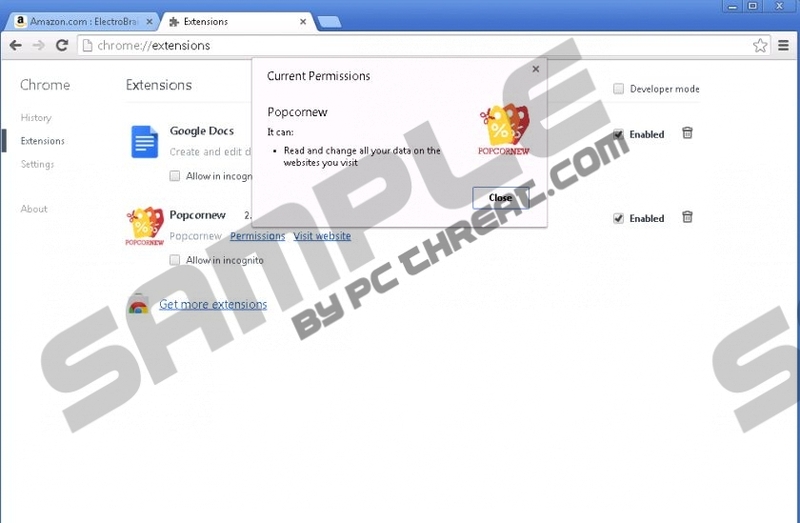 Once it gains access to your operating system, all the mentioned browsers will be implemented with Popcornew extensions. The extensions are used to display the annoying and worthless adverts while you are browsing the web. Unfortunately, the removal of the suspicious extensions is not enough to stop the annoying activity; complete removal is needed to terminate every process associated with Popcornew. To make matters worse, it has been noticed that Popcornew could expose your operating system to potential harmful web content. Since the adverts are provided by adware servers, which are known to be linked to malware distributions, it is very likely that you could click on an advert containing a redirect link. This means that you could end up on websites that promote fake software or various fake services. Such websites are crafted by cybercriminals in order to infect your system with malware or to steal your sensitive data. It should be more than obvious why complete removal of Popcornew is so essential. Popcornew does not provide any beneficial features whatsoever and might even lead to more suspicious programs being installed on your system. Do not take the risk of running Popcornew, as it could have devastating outcomes on your operating system. Execute manual removal of Popcornew with caution, as just one mistake could mean that the infection was not removed entirely. It is a good idea to check directories such as %APPDATA%, %PROGRAMDATA%, and %PROGRAMFILES% for potential leftovers because often adware applications reside there. Further analysis of the potential Popcornew will include checking the Windows registry system, but keep in mind that such analysis should be executed by advanced computer users, as just one mistake could cause your computer to malfunction. If you want to be 100% sure that Popcornew is gone, scan your system with a reliable antimalware tool after manual removal. Select Settings in the Charm bar. Select Popcornew and click Remove. Type Control Panel into the text box and tap Enter. Click Uninstall a program and select Popcornew. Click Uninstall and confirm that you want to remove Popcornew. Right-click Popcornew and select Remove. Quick & tested solution for Popcornew removal.